Handcrafted Cultured Freshwater Pearl Garland Necklace, "Pure Innocence"
Innocent white cultured pearls meander daintily around the neckline, like petite flower buds on a garland. Sasina of Thailand creates the very feminine necklace, which closes with a silver plated lobster claw clasp. 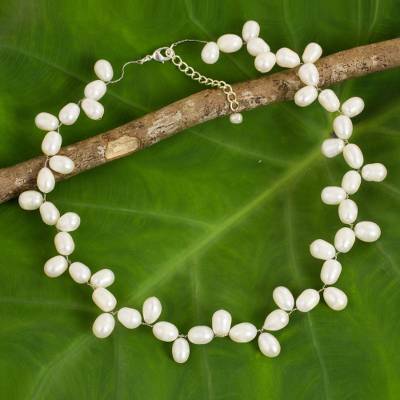 You can find cultured pearl necklace 'Pure Innocence' by Sasina in jewelry categories such as Bridal Necklaces, Birthstone Necklaces, PEARL Cultured Necklaces, Pearl Necklaces, PEARL Freshwater Necklaces, Stainless Steel Necklaces, Silver Necklaces, Sterling Silver Necklaces and Beaded Necklaces. Enjoy exploring these sections for other Novica treasures.